On my way home from work today, the front page on the news paper Dagens Næringsliv caught my attention. 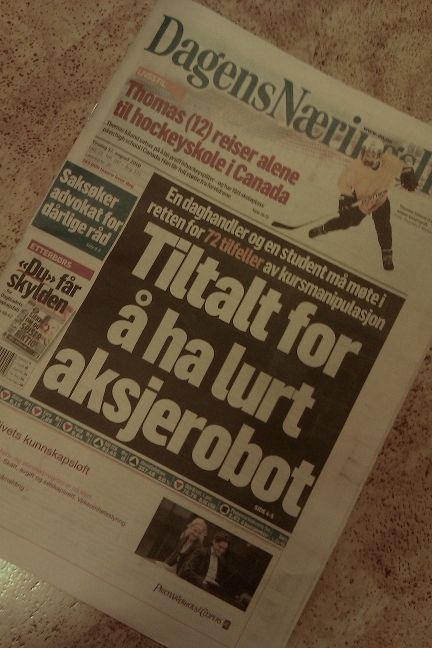 It says “Tiltalt for å ha lurt aksjerobot“, which translates to something like “Prosecuted for having fooled shares robot”. Two people, a day trader (Svend Egil Larsen) and a student (Peder Veiby) have both been prosecuted with stock price manipulations. According to the article they have not known each other or cooperated. There are around or over 2200 transactions in total, and their counterpart have been a trading bot operated by Timber Hill. Both traders have made a profit on their trades, performed in relatively illiquid shares, listed on the Oslo stock exchange. Between November 2007 and March 2008, on several occasions, ranging from 30-40 to under 200 transactions have been performed over a few minutes to a few hours (less than a day). This whole thing sounds a bit strange to me.. I guess you can say that the two people being prosecuted here don’t fit under the typical HFT definition. But I ask; what’s the actual difference between what they have figured out and performed manually, and what you have figured out and made an application/automated strategy perform on your behalf? And for all I know, they might have had automated routines helping them out. Unless there are some key elements left out in the article, the behavior of the Oslo stock exchange is both strange and unpredictable as far as I can tell. I guess the moral of the story is: If your doing HFT, think again before you bring your money/liquidity to the Oslo stock exchange. That is, unless you’re loosing money, because then maybe the Norwegian authorities will fight your “case” for you. But let’s say I’m a terrible trader, consistently loosing money on my strategy.. Would you then think it was reasonable that someone then started charging my counterparts with illegal behavior, just because I was doing a terrible job? I don’t think so, at least not if I was putting in my orders under my free will. How is this like robbing a bank? That is exactly the case: One stupid trader (the bot), and two day traders gaining on that..
Read financial regulations… Manipulation is illegal – robbing a bank is illegal! So the real case is – did they manipulate or was just the bot stupid? Thats the case.. It was a story with this from London last year also. So, do you call financial regulatory framework socialism? All articles concludes that this makes a better market.. But, that doesn’t change the fact that I’m able to think for my self and say that this reaction is stupid. This is in no way equal to robbing a bank. If you’re robbing a bank you’re taking money without permission. In this case, the bot were giving away money at its free, stupid, will. In other words, they (the day traders) were not “robbing” the bot. They were merely doing just what the stock exchange is there for; providing a market for anyone who is willing to trade. You didn’t only say that the reaction was stupid. You used the word socialism. (Though I have a feeling that you use those words together :P). I dont know if they where just trading smart or manipulating the market(illiquid stocks are extremely vulnerable for manipulation). Financial regulations are not (supposed to be) related to politics and are basically more or less the same throughout the world. And they are trying to create the market efficient as you say, but also fair.. So you need to take both factors into consideration, and not only the first factor. Regarding socialism, I asked the question if this was socialism by bailing out a bad strategy. The price of the stock did move as a consequence of the trades performed. But the stock price will of course always be affected by trades. So that’s just the way it will always be. And of course, if the stock price hadn’t moved, no one would have gained or lost anything. Also, if the price didn’t move, the bot wouldn’t have behaved like it did. I wouldn’t put money on regulations being able to provide an efficient stock market; only liquidity can provide that. Regulations might be able to remove some limiting factors, but I guess that’s contrary to what regulations are by definition? Fair, sure..